What are hand and wrist tumors? Any abnormal lump or bump, or “mass,” is considered a tumor. The term “tumor” does not necessarily mean it is malignant or that it is a cancer. In fact, the vast majority of hand and wrist tumors are benign or non-cancerous. Any lump or bump in your hand or wrist is a tumor regardless of what causes it. Tumors can occur on the skin, such as a mole or a wart, or can occur underneath the skin in the soft tissue or even the bone. Because there are so many tissue types in the hand (e.g. skin, fat, ligaments, tendons, nerves, blood vessels, bone, etc) there are many types of tumors that can occur. However, only a few of them are seen commonly. What types of hand and wrist tumors are there? 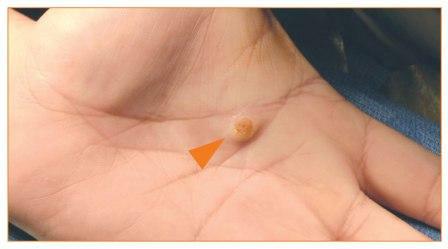 The most common tumor in the hand and wrist is a ganglion cyst. 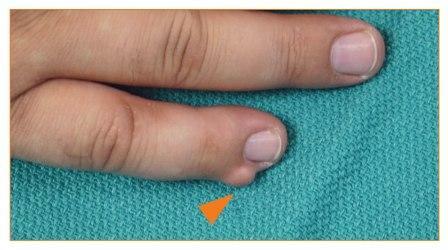 They are seen frequently in the wrist but can occur at the base of the fingers or around the finger joints. 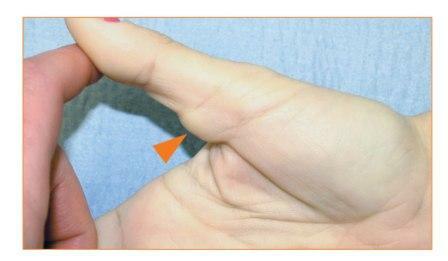 A ganglion cyst is the “ballooning-out” of the lining of a joint or a tendon sheath. The fluid which lubricates the joint or tendon has a thick, molasses-like consistency, filling the cyst making it feel very firm. The diagnosis and treatment options are discussed in more detail in another brochure and in a separate section on the ASSH web-site. There are several treatment options for a presumed ganglion cyst, including observation (doing nothing), aspiration (puncturing with a needle), or surgically removing the cyst. The 2nd most common hand tumor is a giant cell tumor of tendon sheath. Unlike the fluid-filled ganglion cyst, these tumors are solid. They occur anywhere near a tendon sheath (outer lining layer that supports the tendon) and are benign (non-cancerous) and are slow-growing (see Figure 1). Some doctors believe that they may be caused by trauma to the tendon sheath that stimulates abnormal growth. Another common tumor is an epidermal inclusion cyst (see Figure 2). It is also benign and forms just underneath the skin, originating from the undersurface of the skin where there may have been a cut or puncture. Skin cells normally produce a protective waxy substance called keratin. When skin cells get trapped under the surface, such as with a skin puncture, they continue to grow and make keratin, forming the cyst. The cyst is like a sac with a fibrous outer lining and is filled with a soft, cheese-like material, the keratin. (fatty tumors), neuromas (nerve tumors), nerve sheath tumors, fibromas, and glomus tumors, among others (see Figure 3). They are practically all benign. Bone spurs can form, from arthritis or trauma, which feel like hard tumors. 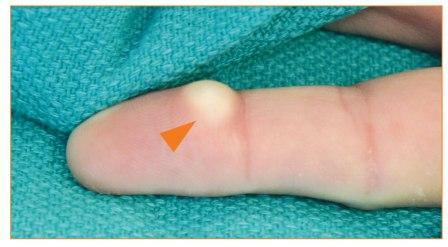 Foreign bodies, such as a splinter, can also cause reactions that form lumps or bumps in the hand (see Figure 4). What about hand and wrist cancer? When patients discover a lump or bump in their hand or wrist, often one of their first concerns is whether or not it is a cancer. Fortunately, cancer in the hand is extremely rare. The most common cancers that originate in the hand are skin cancers, such as squamous cell carcinoma, basal cell carcinoma, or melanoma. Other cancers are very rare but include sarcomas of the soft tissue or bone. It is also possible for cancer to spread to the hand or wrist from somewhere else in the body, such as the lung or breast. This is called metastatic cancer. As with any cancer, a biopsy is usually required to make a definitive diagnosis. A careful history and physical exam performed by a hand surgeon can help to determine the type of hand or wrist tumor. X-rays might be taken to evaluate the bones, joints, and possibly the soft tissue. Further studies such as CT, MRI, or bone scan may be done to help narrow down the diagnosis. Recommendations for treatment are based on the experience of the hand surgeon and preferences of the patient. Typically, definitive treatment with the lowest recurrence rate involves surgical excision of the tumor. Removing the tumor also allows a pathologist to analyze it and to determine what type it is with reasonable certainty. Needle biopsy or incisional biopsy (cutting out a small sample of the tumor) may be considered if the surgeon wants to confirm the diagnosis before recommending definitive treatment. Often, surgery is done under a local or regional anesthesia (numbing the extremity or area) and on an outpatient basis. Risks and benefits should be discussed with the surgeon. Most hand and wrist tumors can be cured with surgery. Some patients may choose to do nothing and simply live with the tumor once they learn that it is probably benign. However, if the tumor changes (eg. skin discoloration, pain, increased size) or if it causes problems with nearby structures (for example, numbness or pain from pressure on a nearby nerve) re-evaluation by a hand surgeon is recommended. Patients should consider the risks, benefits, and consequences of treatment, whether with surgery or without surgery. Hand surgeons can provide information and advice to allow patients to make the best decisions regarding their treatment plans.